The end of July will mark my one year as an official Blogger! I thought that oughta’ be cause for a celebration… so because I like all you fiber enthusiasts so much, I wanted to invite every last one of you to come to my Blogiversary Bash! When? Next Sunday, July 27th! The festivities will officially begin at 12 Noon Pacific Standard Time. Where? Right here at Gettin’ It Pegged! What? Come celebrate with me…we’ll have comment games, prizes, a new freebie loom pattern, and a new video tutorial! What are the prizes, you say??? Well… I guess I can show you that much! 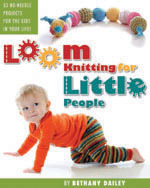 Prize One: a Signed copy of the Loom Knitting Pattern Book! Prize Two: Nine Skeins of Velvet Spun yarn by Lion Brand! Prize Three: Too-cool, gadgety Pom-Pom Makers by Clover! Are these tantalizing enough incentives? I sure hope you all can come! This entry was posted in Blogging, Blogiversary, Contests, Crafting, Family Fun, Free Loom Patterns, Goals, Just Because, Knitting, Life, Loom Knitting, Looming Patterns, Tutorials. Bookmark the permalink. 13 Responses to Will you come to my PARTY? I will try to remember! You know that I will be there with Jenny….party hat on and silly as usual. Ready to PAAAAARTAAAAAAY! I’m ready to cel-a-brate!!!!!! Balloons are ready!!! I’ll be there if this internet behaves. I haven’t been able to post or get on google or yahoo or any links all day. It has been so boring.Our cable provider is working on it but we still are having hiccups and slowwww downloads. I can’t wait to see what you have in store for us. Yipee!! I am counting down the hours until the party starts! I’m trying to get there, but I can’t find the door. Just got home a little bit ago. Rereading my posts and I left out Robin’s and Trudy’s name. Heaven knows a group can’t have the humor of anyone better than Robin and Trudy my helper all the time. If they ever left the groups I would cry.